Gemma was born on March 12, 1878 at Camigliano, a small town near Lucca, Italy. Her parents were Enrico and Aurelia (Landi) Galgani. From her earliest years she was remarkable for her intelligence and also her great interest in all that concerns God and heavenly things. 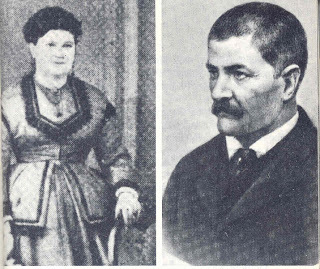 About one month after her birth, her family moved to Lucca, where she remained the rest of her short life. In early childhood, she went to a school run by the Sisters of St. Zita, and she was well educated in the general studies of the time. Her grades show that she was an above-average student, her favorite subject being Religion. One day, one of the Sister-teachers decided to play a game with the young students. The game was “who will become a Saint”, and all the students were invited to draw straws, and lo and behold the winner was Gemma! Was this perhaps a presentiment on God’s behalf? She later was forced to leave the school due to her failing health. "The next morning I recieved Communion. What happy moments I spent with Jesus! He kept repeating to me, Gemma, do you wish to be cured?" I was so moved that I could not answer. Poor Jesus! The grace had been given. I was cured. " Throughout her life, Gemma was to be favored with many mystical experiences and special graces, most notably the stigmata, which she suffered beginning on Thursday evenings and lasting into Friday afternoon, and except for the round nail shaped scars, all traces would soon disappear (sometimes instantaneously), only to come back again the following Thursday evening. 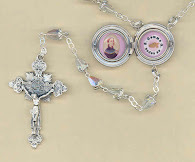 Jesus called Gemma to be a "soul victim", in that she would suffer in union with Jesus, for the conversion of sinners. In other words, her mission was to lead souls to God. Along with the stigmata, at times she would sweat blood. 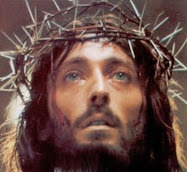 At other times in ecstacy, Jesus would appear to her and place His crown of thorns on her head, and immediately the blood would be seen to flow from various points on her head. There were also times when, representing the scourging, deep gashes would suddenly appear all over her body, sometimes to the bone, through which great quantaties of blood would flow. 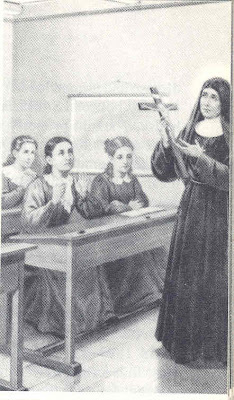 Even though she was given such extraordinary sufferings, she still desired more, her heart all on fire with the love of Jesus, and the desire to save souls in union with Him. One day she wrote "I am the fruit of the passion of Jesus, an offspring of His wounds. Oh Jesus, seek me in love. I no longer posess anything; You have stolen my heart. Treat me as Your Father treated You. Jesus, compel me to drink the cup of your sorrows to the last drop. Give me a little at a time" (St. Gemma Galgani) . Because of her great devotion to the Passion of Jesus, she is often affectionately called the "Passion Flower." She was frequently drawn into ecstasy, even several times a day, often after receiving Holy Communion, or at times of prayer, or even at times she would fall into ecstasy at the mere mention of the love of Jesus or of heavenly things. In her humility, the thought that others may discover the great graces being shown to her by God, caused her great suffering. She would always humbly seek to withdraw from others to be alone when she felt herself being drawn into an ecstasy. It was also noted by her companions that because of her great love for God, she would be horrified when she would hear someone blaspheming, or cursing the name of God. In ecstacy, she would see at times Jesus, at other times Mary, her guardian angel, the Saints etc, who would converse with her and encourage her to continue to offer herself as a victim for the conversion of sinners. Even when not in ecstacy (in a normal state), she would often see her guardian angel who would guide and instruct her on various matters. Like many mystics, she would also at times be tempted or tormented severely by the devil or the demons, who would often appear to her in bodily form. Her nickname for the Devil was "Chiappino". There were several occasions where he, appearing to her as a little man or a black dog, beat her severely, dragging her by the hair and on one occasion, he pulled her arm so forcefully, he caused it to become dislocated, "But afterwards Jesus came and touched my arm, and all was better" she wrote. Knowing her mission as soul victim, the Devil once said to her "You can pray for yourself, but if you pray for others, I will make you pay dearly for it"
On Thursday nights into Friday afternoons, Gemma would often go into ecstacy and recieive the stigmata, or at other times the crown of thorns or the scourging, and would suffer in union with the sufferings of Christ, for the conversion of sinners. These special graces were often misunderstood by others, causing ridicule. On at least one occasion, her sister, Angelina, finding Gemma in ecstasy, called her friends and proceeded to mock and tease Gemma. Gemma wished to become a nun, especially a Passionist, but such was not God’s will, and either her poor health or her unusual mystical life prevented her from being accepted at the three different religious orders that she applied to. Eventually towards the end of her life she offered this disappointment to God as a sacrifice. Because of her miraculous cure in part through the intercession of the Passionist brother, St. Gabriel Possenti, and also her association with her spiritual director, Passionist priest Father Germanus C.P., after her death she was considered a lay Passionist. In fact, not long before her death when she was denied entrance into the Passionist community of Sisters in Tarquinia, enlightened by God she said “the Passionists will not have me in life, but they will have me in death”. And this in fact is exactly what happened. In late 1902, Gemma fell ill once again, this time with tuberculosis. By Holy week, 1903 she was once again completely bedridden. On Holy Thursday, she began a period of intense suffering. On Good Friday, she suffered intensely, offering her sufferings to Jesus for the conversion of sinners. On Holy Saturday, April 11th, at age 25, she died surrounded by Giannini family and the local parish priest. He said, "She died with a smile which remained upon her lips, so that I could not convince myself that she was really dead." Within a few years after her death, her spiritual director, Father Germanus C.P. 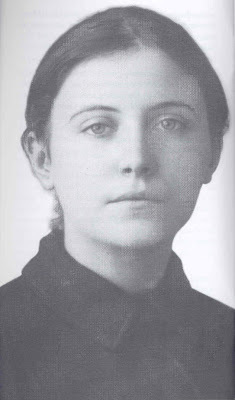 published a biography of her life called “The Life of St. Gemma Galgani”, which includes a detailed first-hand description of her life of heroic virtue. She was beatified in 1933 and canonized on May 2, 1940, only thirty-seven years after her death. She was the first canonized Saint who lived in the 20th century. Her feastday is April 11th (May 16th in the Passionist community). "I shall love You Jesus, I shall love You always; when day breaks, when evening turns into night, at every hour, at every moment; I shall love You always......"
What a beautiful story and a wonderful blog you have. I found you through A Traditional Catholic's blog. Past week I have been feeling very low,wondering if my life has been worth living and allowing myself to be depressed. But not after finding this beloved saint through spiritdaily.com.THANK YOU VERY MUCH.I am now at peace.Proudly Catholic.Rosa, Zambia Africa. Yes, I know what you mean...life is very burdensome sometimes. 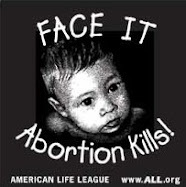 But, Jesus said "come to Me if you find life burdensome, and I will give you rest". The thing is, we are not alone, you know? Our dear Jesus is always with us. I will pray for you. Please also pray for my family and I. What a beautiful blog! I love to read about different saints. They really inspire me and I learn so much from them, especially the value of suffering. Keep up the good work! I will visit often. Its a pleasure to meet you. Thank you so much for your kind comment. I am glad to hear you enjoyed the website. What a wonderful witness to God's love is this blog. Wouldn't it be wonderful to be able to have such a close and loving relationship with Jesus as she did? Even in utter pain, she felt his love as strong as a burning fire. In that pain, she felt joy. This is what Jesus wants us to know. His love is stronger than pain, stronger than death. May you and all who read this receive His love in abundance always. A poor sinner, too, Laura from Tacoma, WA. Thanks so much for your comments. Yes, her love for God is so inspiring! We can really learn alot from her, especially how to sacrifice and suffer out of love for God. I am glad you enjoyed the site. 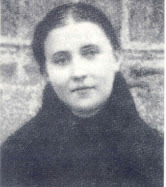 Hey, i am making my confirmation on the 6th of November and St Gemma Galgani, ichose her because we have something alike and i also picked her for an amazing story and this story just touched me, it was really GOOD!!! Thanks so much for your kind comment. It is wonderful to hear that you chose St Gemma as your Confirmation patron. I pray that she may guide you and be your special friend always! I was reading a book and St. Gemma's name came up, so i decided to look up her story. I am so glad that I did. I never imagined how wonderful it would be to learn about her relationship with Jesus. I'm in tears right now because this could not have happened to me at a better time. Thank you for putting her story out there for people like me to come across it. I am so happy to hear that Gemma is inspiring you! May she become your special friend and advocate with Jesus! i have chosen her for my patron saint because she's so holy and her feast day is on my birthday april,11 1998.she's also a modern saint. i want to be more like her. I am so glad to hear that you have chosen Saint Gemma to be your patron Saint. I pray that she may always be your special friend and advocate with our loving God.